Before there were Destinations, before Wider Opportunities, Senior Roundups were often the highlight of a Girl Scout career. These two-week encampments brought together high school-age Girl Scouts from around the country plus a few Girl Guides as well. They lived together in small groups, engaged in special programs and activities, and generally experienced the scope of the Girl Scout movement. Four Roundups were held: 1956 in Detroit; 1959 in Colorado Springs; 1962 in Vermont; and 1965 in Idaho. Fifty years since the last Girl Scout Roundup! It’s hard to believe that much time has passed. Anyone who attended one of the Roundups knows what a wonderful experience it was. I was thrilled when I received my selection notice in December 1961 for the July 1962 Roundup, scheduled for two weeks in Vermont! GSUSA President Olivia Layton calls Rounduppers to dinner in 1957 (GSCNC archives). The excitement had been building since mid-May of 1961 when all the Washington Metropolitan Area Roundup applicants met for an orientation meeting. This included Senior Scouts from five Councils that were merging to become the Girl Scout Council of the Nation’s Capital – Alexandria, Arlington, National Capital, Northern Virginia, and my council, Southern Maryland. Each of these Councils selected their own representatives to Roundup; Southern Maryland was sending two patrols of eight girls each. In early July, we formed initial patrols, elected patrol leaders, and started to meet on a regular basis. After a rigorous process, the Southern Maryland Council made their selections, and the two patrols were finalized. In the following months, we honed our camping skills and worked on our demonstration and swaps – we became a close-knit patrol and were ready to go. On the evening of July 17, 1962, all the area patrols gathered on the Washington Monument Grounds and received a grand send-off from family, friends, and Council officials. At that time, we each received a waterproof ID (think old-fashioned hospital wristband) that we wore at all times until we got back home. We boarded three buses and headed north. We were excited, we talked, and we sang – there wasn’t much sleeping on the bus! We arrived late morning on the following day and located our patrol equipment and personal belongings. Tents, cooking utensils, and individual duffel bags, with all the important things – our clothing, swaps, stationery for letters home (this was long before cell phones!) – had been shipped a month beforehand. We then headed to our designated spot to pitch camp. The entire encampment was divided by Section, Camp, and Troop, with each Troop containing four Patrols of eight girls each. All patrol items were marked with our specific number – 2F82. Each of us had an added number indicating our position in the patrol so all my clothing and personal items, for example, were marked 2F82-1. We settled in and met our Troop Leader, Jerry, and the other three patrols that made up our Troop – from upstate New York, western Illinois, and southwestern Minnesota. We got to work building our patrol picnic table, which was a bit challenging – I think we used a whole box of nails to hold it together! One day it collapsed – it didn’t fall apart – it just sank to the ground. It was easy to fix – just needed more nails. Tents pitched at the first Roundup, Detroit, 1956 (GSCNC archives). There was always something to do! In addition to preparing food, eating, and cleaning up, there were patrol meetings to let everyone know what was happening that day. Sometimes, we had assignments, such as being part of the flag ceremony on the Avenue of Flags. There were demonstrations by each patrol about something related to our home area. Because jousting is the Maryland State Sport, our patrol demonstrated a jousting tournament – with cardboard horses. The demonstrations were always interesting and fun to watch and, if you were lucky, perhaps you could get a taste of rattlesnake meat – really! In the evenings, we joined other patrols at Troop or Camp programs – perhaps folk dancing by Girl Guides, singing (of course), and Arena events. The official camp uniform was “greenies” – dark green shorts and knee socks, and white camp shirt. It was very sharp looking but we could only take so many sets along – that meant hand laundry and line drying. Roundup was open to the public and we had a lot of visitors – the first day that Roundup was open to the public, over 4,000 people visited and that number increased. The patrol areas also had to be ready for visitors during certain hours of the day. Any wet laundry had to be out of sight during those times and, combined with almost daily thunderstorms, clothes took a while to dry! There were career counseling sessions, visits with Burlington College language students, and exhibits. Vermont is a big dairy state, and the cows and milking machines were a big hit! There were even milk dispensers scattered throughout the area. We drank a LOT of milk! 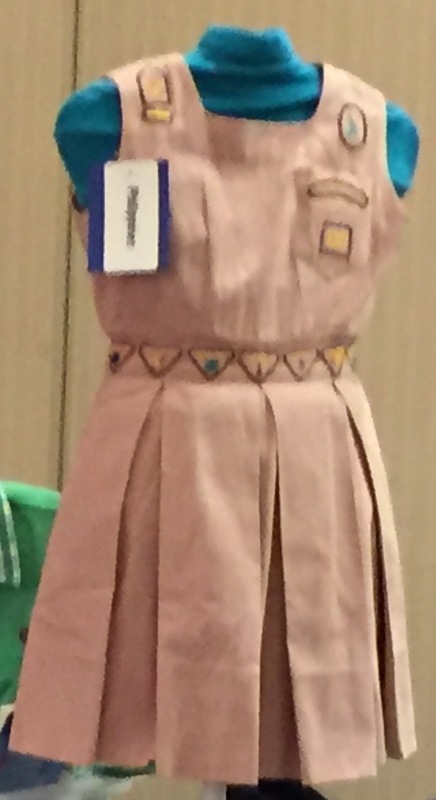 Regulation camp uniform (GSCNC archives). Whenever, wherever, we exchanged swaps! Every State was represented and Girl Guides from 15 member countries attended. Meeting them was simply terrific! The best place to put all those swaps was on your Roundup hat – until you ran out of space and then you safely packed the rest away. Our patrol’s swap was a small, thin, pointed wooden dowel – like a jousting lance – slipped through a round piece of material (Pellon®) with Southern Maryland Council written on it and, of course, our own name and address. For our meals, we received recipes and bags of food. We had enough for nine people because we always had a guest – usually a Troop Leader or Staff Member. We cooked on charcoal and had made many, many fire starters soaked in paraffin which were safe, lightweight, and easy to pack. We celebrated the 50th Anniversary of Girl Scouting with a special meal of grilled chicken. We received 4 ½ chickens – 4 were whole. Only one of us had the foggiest clue of what to do with a whole chicken. We ended up with a total of 90 pieces of chicken – some were a little small but it all tasted great! The 1962 Roundup focused on the 50th Anniversary of Girl Scouting – “Honor the Past, Serve the Future.” The 50th Anniversary stamp was issued from Roundup, and we all kept the on-site Post Office busy by mailing First Day covers. One of the Arena Events was a special celebration of the 50th birthday, with special guest of honor Maria von Trapp visiting from nearby Stowe. The arena, a natural hillside, was a perfect setting and could handle 10,000 people. You can image 10,000 Girl Scouts on the move! Stop by the Nation’s Capital main office at 4301 Connecticut Ave., NW in Washington, DC, to see an exhibit of items from the various Roundups. Why were the Roundups canceled? Read about it here!